I am a third year graduate student working with Professor Dominik Riechers on studying the interstellar medium (ISM) properties of distant galaxies. Despite great progress made in studies of galaxy formation and evolution over the past decade, we are only beginning to fully understand how galaxies interact and evolve, and which key mechanisms are responsible for driving the bulk of stellar mass assembly in the universe. Since the ISM is the natal environment from which stars are formed, tracing the molecular cold gas in the ISM — the immediate fuel for star formation — via e.g., carbon monoxide (CO) molecules is particularly important. By characterizing the ISM of these distant galaxies, my research aims to improve our current understanding of how galaxies and their supermassive black holes were formed in the early universe and how they have evolved since then. Most of my research is done by observing the light that was emitted billion years ago using arrays of telescopes (interferometers) that operate at radio and sub-⁠millimeter wavelengths. For instance, some of my work (e.g. 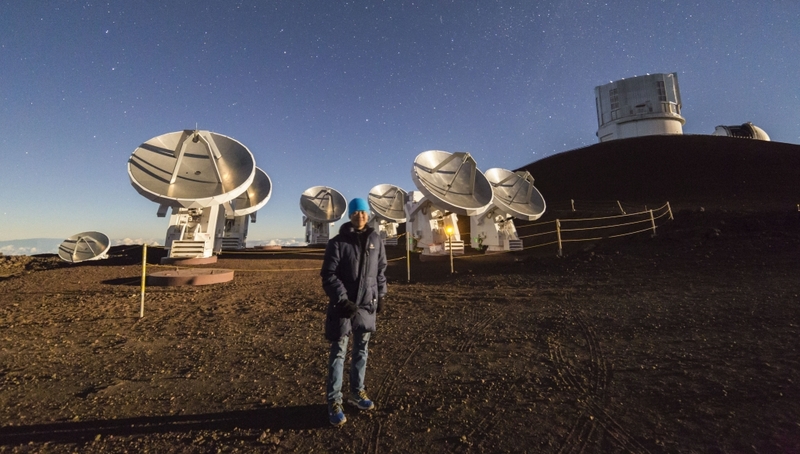 Leung & Riechers 2016) has made use of the data collected from the Submillimeter Array, which is shown in the background of this photo. Thinking that my work has an impact on the quest of uncovering the mysteries of the universe — a common goal to all human beings — is the impetus to my work. Beyond my research contributions to the field, I also value my work as a teaching assistant, an important role that allows me to share my fascination towards the subject of astronomy with undergraduate students. It is my humble wish that I too can spark interests in our students at Cornell who may one day become future scientists. As someone brought up in the tropics, I do not enjoy dealing with the brutal winters here in Ithaca, but as I reflect on the past two years here, I have never regretted my decision of coming to Cornell to pursue my doctoral degree, thanks to the group of supportive colleagues and my advisor who have provided me with an excellent learning environment. Besides work, I enjoy exploring outdoor sceneries, hiking and doing landscape photography. I have been taking timelapse videos around Ithaca that I anticipate to release when I graduate.